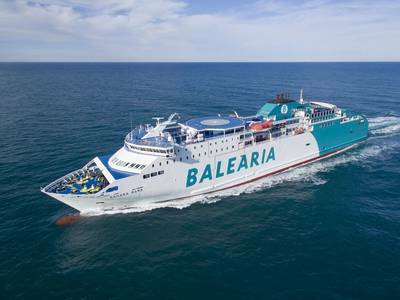 Spain's Baleària will convert three ferries from diesel to LNG dual fuel using Caterpillar and MaK solutions. Incorporating the MaK DF engines will virtually eliminate the sulfur and particulate matter in the exhaust gases, while also cutting down NOx, resulting in even lower CO2 emissions. The three ferries to be converted are Abel Matutes, Bahama Mama, and Martin i Soler, each currently equipped with a pair of MaK 9 M 43 C main engines. After the conversion, the vessels will operate on two MaK 9 M 46 DF engines, which has a rated engine output of 8,685kW. The MaK engines are used in a control pitch propeller application with a gearbox. The conversion will allow the engines to be powered by gas. Caterpillar will provide DF-Engine conversion kits and all the required engine modules including an ignition fuel oil module, engine ventilation modules, an exhaust gas ventilation module, GVU ventilation modules, and gas valve units with housing. Included in its planning to expand and renew its fleet, Baleària will also replace the existing main engines on board their high-speed ferry Jaume III with four new Caterpillar 16-cylinder C280 propulsion engines; each engine delivers 5,650 kW at 1,000 rpm. A similar repower was done back in 2017 on board the sister vessel Jaume II resulting in a notable increase in efficiency and service, with the ship being able to reach high transit speed.